PRO Compression socks offers true graduated compression, which increases blood flow and allows you to perform at your peak, recover faster and feel better sooner. 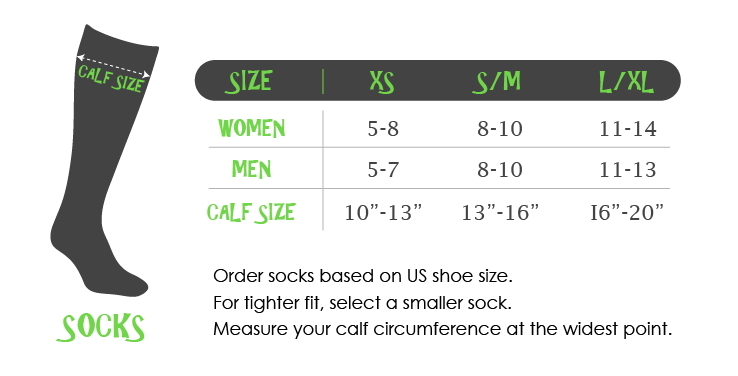 Graduate to a smarter sock : Marathon Socks have a true graduated compression. This means more blood flow, better circulation and less swelling which results in a quicker recovery. It's all in the threads : Our proprietary blend of materials provides all-over moisture control, while our advanced construction supports your critical muscles and tendons and cushions the bottom of your feet. All of our socks are proudly made in the U.S.A. Supporting your active lifestyle : We believe in making apparel that helps you look good, feel good and do more of what you love. Serving both form and function, everything in our line is thoughtfully designed to let you show your style while also supporting your daily activity. Whether you’re training for a tri or trying to keep up with kids, everyone can enjoy the benefits of our compression-wear.